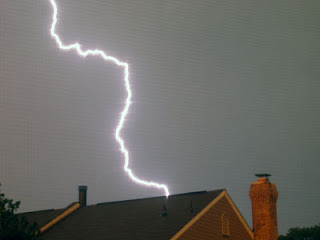 Lightening either struck our house or flashed incredibly close to it. Rob was outside with an umbrella in close proximity to a light connected to the roof at the time this occurred. Rob experienced an intense shock that caused him to fling the umbrella, dive into the family room and for a brief, confused moment, was unsure if he was about to die. Various family members heard an incredible boom that rocked the rock, lit the house and cause ear drum aching. Various family members heard Rob screaming (or, as he claims, yelling). Chandler and I from different parts of the house ran to the dining/family room to find Rob on the ground screaming or yelling (depending on who you ask) while holding his arm/hand and mumbling in between things like, "My arm." "My hand." "Oh my G-d, my arm." "My stomach." After the initial shock wore off, and I had asked repeatedly if he needed me to call an ambulance (at this point, I did not know any details or even what had happened to him), Rob says no, he is feeling better. Side note: at this point he was still kneeling on the ground holding his hand out and looking maniacal. Rob stands up, and he and Chandler go into the kitchen to look out the window when they notice a burnt wire smell. I went to investigate and indeed, the kitchen was starting to smell more and more like burnt wires. Up to this point, everything was in slow motion. Cut to the part where everything happens at one time. Quickly I change clothes, grab diapers and wipes, a few stuffed animals, bark directions at Chandler and Alia to do the same, stack items at bottom of stairs, gather the children, go outside in the rain. The neighbors come over and we go to their place. Chandler and Rob stay behind to wait for the FD to get there. Firemen arrive. They are tired (it was a busy night) and not in a very good mood. No fire is found in the wall area. The brand new Shabbat hot water pump is fried and emitting the odor of burnt wiring in the kitchen. The alarm clock in the bedroom is also fried. Downstairs, the smell is terrible. It is hard to breathe the air. The computer, sub woofer, speakers are all fried. The Wii and the X-Box 360 also fried. It smells intensely of burnt or burning wire. Fire Department leaves with the words, "If the smell gets worse, just call us back." We are unsure at that point if there is an undiscovered fire, the place is a potential fire, etc. Also, the air inside is unbreathable. My paranoia kicks in and I am sure if we don't get out QUICKLY then my children will suffer irreparable lung damage and the house will burn down the second we all fall asleep. The neighbors offer for us to crash at their place, but there are the dogs and Neviyah who may never get back to sleep. we don't want to keep them up all night while our kids try to adjust and we try to process and our dogs go on their Jack-Russell-spaz-fest. We decide to try a hotel. By this time, it is 2-ish. We find one by my work that accepts dogs for $100 extra. There is no time to haggle. We are beat. This is the point where Alia begins to seriously freak out. The birds. What about the birds? There is sobbing, and body flinging and all sorts of other drama. Rob goes next door and the neighbors generously, in these wee hours, agree to watch the birds. Then we are off to the hotel--family, dogs and computers. Rob's hand is no longer numb, but it does feel "arthritic." That was so scary when you called last night. Glad the house did not burn down! I'll pray that Robs arm and hand get better fast. Oh, I did not tell you that my car is out of service. Something broke that made the oil drain out and caused the engine to freeze. Need a new engine. Don't know how much it will cost...in the mean time I am grounded - so to speak. I probably won't be able to do laundry on Monday unless I get a rif their and home...yeah, right, duh! Oh goodness... I'm so sorry about the storm. I'm glad everyone in your family is safe!